Where is the room? Knowing where the floor will be installed is essential. 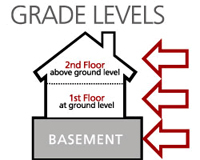 Before choosing a floor, determine if the room is above, on or below ground level (grade). Mohawk Engineered Hardwood Floors can be used in most areas in the home including rooms below, on or above ground level. Solid wood floors are approved for above ground-level installations only. These floors perform better in humidity-controlled environments.Is your sub floor concrete or a type of wood substrate? Engineered floors are ideal for concrete slabs. For remodel projects you may want to consider Mohawk Engineered Hardwood floors that can be floated directly over the existing floor which eliminates the mess and additional costs of tearing out the old floor. Quarter Round Used as a trim piece along vertical walls and the floor. Flush Mount Universal Edge Used to join wood flooring with carpeted areas. Flush Mount Reducer Provides a smooth transition between floors of different heights and materials. Flush Mount Stair Nose Placed on stairs and landings to cover exposed edges of wood flooring. T-Molding Joins two areas of wood flooring of the same height, usually in doorways or thresholds. Baby Threshold For Engineered Hardwood Floors only. Used to join wood flooring with carpeted areas. Monotrack Used to secure trims and molding to subfloor.